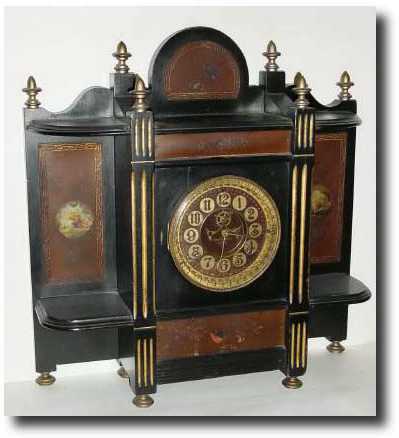 C.1883, Ansonia "ALHAMBRA", mantel clock ebonized wooden cased mantel clock with decorated rubber panels, and in generally good original condition, wear to decorations commensurate with age. Ansonia\'s experiments with hard rubber cases, dials and decorations only lasted a few years, and examples in each category don\'t turn up that often. This particular model also has a gilt rubber dial (both the inset and the chapter ring). On the rubber panels, there are hand painted scenes of flowers and birds which are difficult to make out. The pendulum is not Ansonia, however replacements are available. The movement is Ansonia\'s premium with brass covers for the springs. And lastly, someone cut a small hole in the case bottom for starting the pendulum without turning the clock around on the mantel. Ly illustrates this model in his 1989 Ansonia book, page 182, item 870. Height 19"